The government of the Canadian province of Ontario has announced that a CAD 12.8 billion ($9 billion) project to refurbish the four Candu units at Ontario Power Generation's (OPG) Darlington nuclear power station will start in October. The province has also approved the continued operation of OPG's Pickering plant to 2024. The 3512 MWe Darlington plant supplies about 20% of Ontario's electricity. Darlington 1 and 2 generated their first power in 1990, followed by unit 3 in 1992 and unit 4 in 1993, all with planned 30-year operating lives. Refurbishment will enable the units to continue to operate for a further 30 years. OPG has already put in years of work towards the refurbishment: scoping work was carried out in an initiation phase lasting from 2007 to 2009, while detailed planning commenced in 2010 and was completed in 2015, incorporating lessons learned from other major projects. A state-of-the-art full-scale reactor mock-up has been built to test specialized tools and train workers. The project will now move into the execution phase, scheduled to take 10 years to complete. One at a time, the units will be taken out of service, defueled, and drained of their heavy water coolant and moderator before work begins to restore or replace reactor components. This will involve replacing 480 fuel channel assemblies and 960 inlet and outlet feeders per reactor. Most of the turbine generator systems and auxiliary systems will be disassembled and rebuilt or replaced. OPG has concluded that the steam generators will remain fit for service for the extended life of the reactors and will not need to be replaced, although the steam generator tubes and parts will be inspected, inspection nozzles will be installed and the steam generators will be cleaned to improved heat transfer. OPG's operating licence for Darlington was recently renewed by the Canadian Nuclear Safety Commission (CNSC) and is valid from 1 January 2016 to 30 November 2025. The licence extension authorizes OPG to undertake the refurbishment and life extension work. A team of onsite CNSC inspectors is present throughout any such refurbishment project, to verify safety and compliance with the licence. CNSC staff will provide annual regulatory oversight reports on the performance of the Darlington plants and on the status of the refurbishment project. Ontario's nuclear fleet, which also includes the six-unit Pickering and Bruce Power's eight units, supplies about 60% of the province's electricity needs and is central to a long-term plan to phase out coal-fired generation. 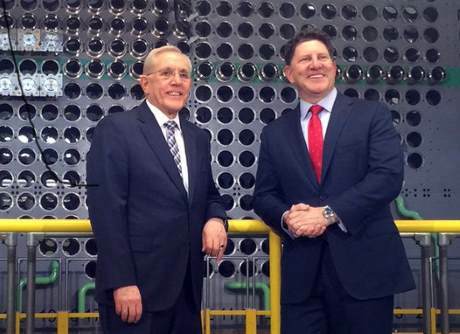 Ontario Minister of Energy Bob Chiarelli said: "Proceeding with the refurbishment at Darlington will ensure that nuclear continues to be Ontario's single largest source of power." Jeffrey Lyash, OPG president and CEO, said the company was ready. "We've been preparing since 2009 and we're ready to deliver the job safely, on time and on budget," he said. The CAD 12.8 billion budget is about CAD 1.2 billion less than originally projected by OPG. OPG has put together a project management team with extensive experience from previous Candu refurbishment projects, including some team members seconded to work on the refurbishment of the Point Lepreau reactor in New Brunswick. The company has also cooperated closely with Bruce Power throughout the extensive project planning stages, it said. Bruce Power, which announced plans to refurbish six reactors on its site in December, said it is working closely with OPG to share information and lessons learned from previous refurbishments, while exploring ways to collaborate to leverage the economies of scale between the two operators. Bruce Power President and CEO Duncan Hawthorne said: "Operating nuclear plants is a unique type of business in the sense that we are not driven by competition between operators, but by our collective success as we share so much in common." OPG has awarded a CAD2.75 billion ($1.94 billion) contract to a 50:50 joint venture of SNC-Lavalin and Aecon Group to carry out the execution phase of the re-tube and feeder replacement. This will involve the replacement of main reactor components using tools and methods developed by the joint venture over the past four years. At the same time as approving the start of the Darlington refurbishment, the Ontario government also approved OPG's plan to pursue operation of the Pickering nuclear power plant until 2024, ensuring a reliable source of low-carbon electricity while refurbishment work is under way. All six Pickering reactors would operate until 2022, after which two would shut down with four running to 2024. Pickering's current operating licence expires in 2018, and OPG said it has started work on a licence application for approval by the CNSC.